Since 1980 the Faculty-wide, student event has raised awareness and tens of thousands for local community organizations. 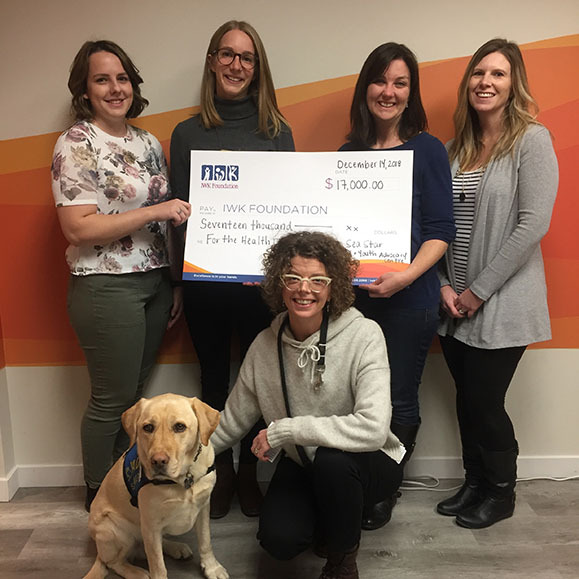 (Left to right, back row to front row:) Cynthia Osborne, Co-Chair of FTHOI 2019, Anneke Funk, Co-Chair of FTHOI 2019, Christina Shaffer, SeaStar Project Coordinator, Kathy Copp, Administrative Assistant, Suspected Trauma & Abuse Response Team (START), Dorado, Accredited Facility Dog, Kathy Bourgeois, Child and Youth Advocate. Cynthia Osborne (MSc Occupational Therapy ’19) and Anneke Funk (MSc Occupational Therapy ’19) can point to many highlights from November’s For the Health of It (FTHOI) variety show, which raised an impressive $17,000 for an important local charity. But if they had to choose the best part, it would be when they presented the cheque to the SeaStar Child and Youth Advocacy Centre. Now closing in on its 40th year, For the Health of It is an annual variety show put on by students from across the Faculty of Health, and some students from Medicine and Dentistry. The friendly competition has an end goal of raising awareness and funds for local non-profit and community groups. Each School or unit submits a short play or skit explaining their profession in a fun way, and judges determine who brings home the title of Best Overall performance. “This year, Physiotherapy won, ending Occupational Therapy’s two-year streak, but who’s counting!” Cynthia says good-naturedly. Other units involved in this year’s event included Occupational Therapy, Physiotherapy, School of Communication Sciences and Disorders, Social Work, Nursing, Pharmacy, Health Sciences and the Faculty of Dentistry. She and Anneke say the Faculty works very hard at developing strong interprofessional skills among students, and this is a way for them to utilize those IPE skills in an entertaining way, for a good cause. This year’s recipient of the donation was SeaStar Child and Youth Advocacy Centre, currently based at the IWK Health Centre. The SeaStar team coordinates a response for children and youth who have experienced violence. Through SeaStar, professionals from law enforcement, child welfare, health care, mental health and the justice system come together in one child-friendly location, with the support of an accredited facility dog, Dorado. By bringing investigation, assessment, and treatment services to one location with professionals who have a trauma-informed lens, SeaStar aims to decrease trauma and improve outcomes for children and youth who may have experienced abuse. “The more we learned about SeaStar and working in close contact with representatives, the more we came to understand the importance of their work, and we became very passionate about the cause,” Anneke said. Nancy Walker, an Instructor in Physiotherapy and a Dal grad (BScPT ’81) is one of the creators of the original For the Health of It event, which took place in 1980 at Queen Elizabeth High School — tickets back then were $2 each. “My friend in Physiotherapy and I dreamed up this concept and Nursing and Pharmacy were the other two groups involved. The first year, we barely got it off the ground — it’s so exciting to see how the event has evolved!” she says. Nancy says although the end goal is to raise funds for charities, the show has many other benefits. “We get to see the incredible talent of the students — it’s remarkable just how much talent we have in our Faculty,” she says. “The students get to know one another and collaborate across Schools, there is an interprofessional aspect, it helps the community and it’s just a lot of fun,” she says.